As the iOS faithful know, Cydia is the Jailbroken iOS app store that complements the official Apple App Store. It doesn't compete with the App Store, because it doesn't offer the same apps; it supplies unofficial iOS apps that offer themes, iOS tweaks, and enhancements for jailbroken iPhone handsets, iPod units and Apple iPad tablets that Apple doesn't offer at all. 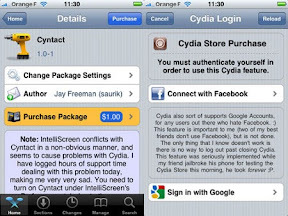 But just like the official Apple App Store, the Cydia store offers both free and paid items for its customers. Many iOS device owners visit Cydia daily to enhance and customize their devices, it appears that big companies may now be looking to Cydia for advertising. According to an article over on 9to5 Mac by way of Modmyi, Car making giant Toyota is apparently running an ad on Cydia to promote the Toyota iPhone UI theme as part of their campaign to promote the Scion tC. Obviously this move by Toyota to advertise on Cydia will undoubtedly annoy Apple as Toyota could have been a potential iAds advertiser, but it does go to show that even the big names in the motor business aren’t against advertising with something Apple doesn’t like. Scion brand appeals to car owners that want to customize their car versus just buying a off the slot clone, so this makes a lot of sense that Toyota would be interested in this market segment.